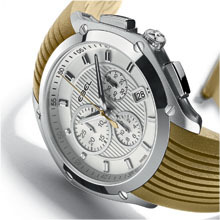 The EBEL Classic Sport collection introduces a new Chronograph model outfitted with an appealing range of colored straps – khaki, beige, brown, coral pink and navy blue. These attractive shades create a natural palette that lends a fresh and original touch to this classic collection. After ‘dressing’ the Classic Sport in khaki, EBEL now offers softer, muted versions that enrich the palette with two additional colors: beige and brown – warm and subtle shades to enliven the coolness of early spring. Elegance and design are the keynotes of this new chapter in the Classic Sport series which gives pride of place to natural hues. 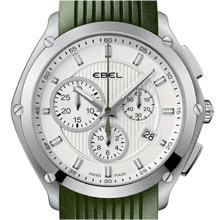 EBEL artfully combines technique, comfort and style in these appealing new models: The delicate striped motif at dial’s center and the meticulous finishing of the sub-dials make a perfect counterpart to the subtle coloring of the hands which in turn reflect the color of the strap. With pushers that are cleverly integrated into the case design, the chronograph functions meld seamlessly into the aesthetics of the model. EBEL once again proves that a delicate touch can go hand-in-hand with watch-making mastery. Adopting these chic and colorful new watches is a fine way of stepping off the beaten path. EBEL dares to explore new horizons in a spirit of good taste and distinction.